Increase your confidence as you contribute your ideas in financial planning meetings with upper management. Speak the language of the people who control your organization’s purse strings. Develop performance reports that show planned vs. actual income and expenses. Enhance your decision-making skills by better understanding the financial impact of your choices. Cut through the complex jargon of accounting. Build a reputation for consistently being on budget. Apply the universal ground rules of finance to any organization’s reports and planning processes. Get your new ideas implemented and applauded for their bottom-line results — rather than set aside and left untested. Assess the liabilities and payoffs of new ventures, proposals and plans. … feel uncomfortable in discussions with financial and accounting specialists. … don't fully understand financial terminology "buzz words." … don't effectively use budgets, balance sheets, P&L statements and other financial data. As a non-financial person, your actions and decisions affect the financial picture. But, if you're making those decisions without a solid knowledge of finance and accounting, you're operating in the dark. Finance courses for beginners are developed to meet the specific needs of non-financial people like you. 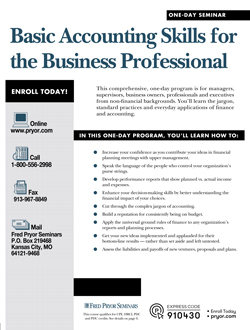 With our training class you'll learn the basics of accounting and finance in easy-to-understand layman's terms. What's more, you'll learn how to apply and use the information to operate more efficiently and successfully. We cover all of the essential elements of finance and accounting in one fast-paced, well-designed day. And, our extensively tested adult learning methods will have you participating and interacting — you'll be on the edge of your seat — not slumped down in it! What accounting is and how it affects your job and your responsibilities. Three key accounting terms that form the financial cornerstone with brief, easy-to-understand explanations. An invaluable reference — A financial glossary in your workbook to quickly explain unfamiliar jargon. (Most terms are defined in just one line). Two easy rules to ensure the basic accounting equation stays in balance. Eleven essential principles and concepts — the whys and how’s of financial reporting and accounting systems. When expense and revenue activities are reflected on the books, and how to anticipate your organization’s current and future financial status. Two basic methods used to recognize expenses and revenues, and why transactions have been included or excluded on financial reports. 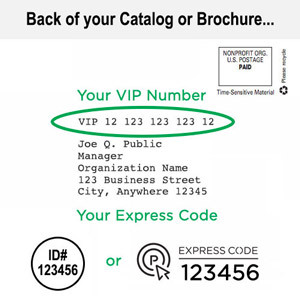 Three conditions that signal deferred expense or revenue (and help you clear up the mystery of missing numbers). PC software for financial novices: an overview of the best software for basic financial tasks — uncomplicated and easy to learn. PC potential: how you can tap into computer tools you may already have to simplify financial analysis. The difference between direct and indirect expenses and who is responsible for each. Five key points will help you identify fixed and variable costs so you can better anticipate and control expenses. Why costs beyond your control can directly affect your own financial performance. How you can increase profitability in your department or organization with a better understanding of the break-even point. Three ways you can still break even when revenue activity falls. A simple break-even chart that puts the numbers in an easy-to-understand visual form. Capital expenditures simplified: three conditions to meet for an item to be capitalized. Six items to include in capitalization figures and four items not to include. Purchase or lease? The benefits and drawbacks of both options. The two basic methods of depreciation and how they affect financial results. The eight objectives for financial reporting and how financial reports can work for you. The four most common financial statements (including easy-to-comprehend examples for each). How everyday business transactions are translated into balance sheets and profit-and loss statements. Four basic components of performance reports to improve operations in your department or organization. “Ratio Analysis”: 10 invaluable formulas to analyze financial statements like an expert. How to analyze financial reports for profitability, activity, liquidity and debt coverage. (Simplified formulas make it easy). Four professional methods to measure bottom line profitability. How sound budgeting leads to better, more effective management. An easy seven-point budgeting outline to prepare a new budget or assess your current one. What’s a “support budget?” How the four major types affect your department and your organization. Five sample tables that illustrate how budgets are built, step by step. How to use budgets to measure the performance of your department, your organization and even yourself. Ten specific answers good budget performance reports should provide. (Check your reports against this comprehensive list). Five cost indicators and three productivity indicators for new insight on budget performance. Eight expert techniques to help you prepare and monitor your budgets more accurately and efficiently. Personal Skills Assessment: a quick quiz to pinpoint your strong and weak areas of knowledge. Interest and Present Value Tables: easy-to use charts to quickly determine the time value of money. Break-Even Point: two simple formulas to determine break-even in dollars or in units. Debits and Credits: a handy “framework” reference for understanding ledgers and financial reports. Balance of Accounts: a simplified breakdown for balance sheets and income statements for easy classification of debits, credits, assets, liabilities and equity. Financial Glossary: dozens of terms defined in clear, concise and easy-to-understand language. Salary Budget Checklist: 12 specific points to review before finalizing a salary budget. Non-Salary Budget Checklist: seven practical items to aid you in preparing the non-salary budget. Capital Budget Checklist: eight essential details to help you build a sound capital budget. Debits, Credits and Balance of Accounts: 10 failsafe rules and tips for classifying financial items.